The Highland 10396 Car Roof Bag & Rainproof Cover will add to your comfort and convenience while travelling. The duffel bag was designed with inline skate wheels to make it wonderfully portable. It also comes with a protective cover that keeps dirt and road grime away. This car top carrier has mounting straps that attach it securely to the roof of your car. If you’re out on the road a lot, this car top carrier is a great way to add more space to your vehicle. Measuring 34 inches in length, 15 inches in width, and 14 inches in height, this cargo bag can accommodate quite a load. 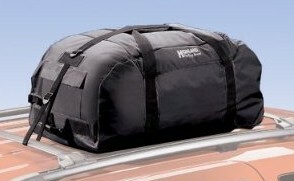 The Highland 10396 Car Roof Bag & Rainproof Cover have only garnered 15 reviews on Amazon.com to date. All reviewers have given high ratings so far, but not without a few suggestions on how the product could be improved. Protective cover not durable – While customers agree that the duffel bag is excellent, they seem to think that the protective cover is quite useless. Some have complained that the cover started to rip apart after just a few uses. Others have also reported that the drawstring used to tighten the cover around the bag easily gets stripped. Good at keeping the water out – Most reviewers were impressed at how the Highland 10396 was able to keep moisture out of their belongings, even after driving through considerably heavy rainfall. Easy maneuverability – Thanks to the built-in smooth polyurethane wheels, the duffel bag is delightfully easy to move around. Ample space – Customers were also satisfied with the amount of storage space that the duffel bag provided. It holds up fairly well even when packing bulky objects. Stays put while you drive – The straps for this car top carrier are well-made and strong enough to hold the duffel bag in place while driving, even at fairly fast speeds. Durable – Except for the protective cover, the duffel bag definitely seems very sturdy and looks like it could last through several years of road trips. Customer reviews for this product are still few, but things are looking up so far. More than a handful of Amazon users have praised this car top carrier for being able to effectively keep water out of their belongings when driving through rainy weather. A big plus is also the inline skate wheels that make the duffel bag wonderfully easy to move around—a great feature for elder people or those with back problems. All in all, the Highland 10396 Black Rainproof Cover and Duffel Bag Car Top Carrier sounds like a great buy.